One of architect Frank Gehry’s earliest public buildings collapsed this month as it was nearing the end of a five-year, $55 million renovation, forcing the owners to revise their plans. 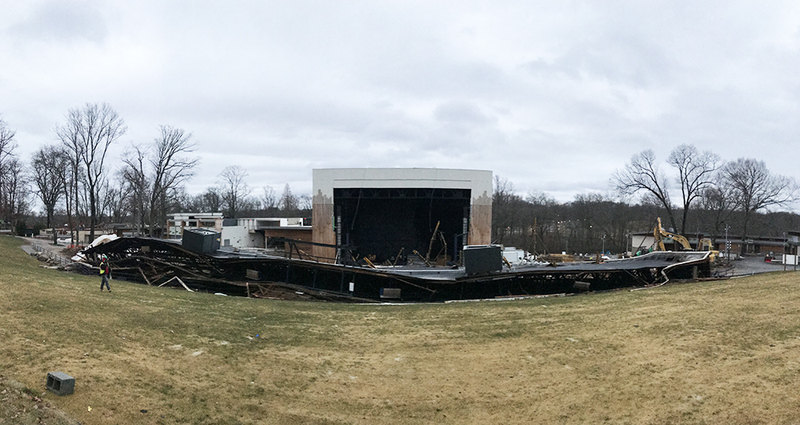 The roof of the Merriweather Post Pavilion, a 19,000-seat open-air concert venue in Columbia, Maryland, crashed down in the middle of the night on Saturday, January 13, burying the seating below. No one was injured. Designed by Gehry, Walsh and O’Malley, and opened in 1967, the concert pavilion was being renovated to help it compete with other performing arts centers. The design team, led by JP2 Architects of Baltimore, opted to keep the original roof because it was a defining element of Gehry’s design. But the designers also wanted to raise it to improve sightlines. Gehry, now head of Gehry Partners, is not part of the design team, but had been briefed on the project and toured the site several years ago. The roof collapse makes the concert pavilion one of the first major Frank Gehry buildings to be substantially lost or altered -- despite the owner's efforts to retain its architectural integrity throughout the renovation. The roof was in the process of being raised on hydraulic lifts 20 feet above its original height when it collapsed. The pavilion’s operators said this week that they intend to build a new roof in time for the summer concert season, and that it will be at the 51-foot height to which the original roof was being moved. Investigators have not disclosed a cause for the collapse, but there has been speculation that wind was a factor. The chairman of the pavilion’s operating company, Seth Hurwitz of I. M. P., alluded to that possibility in a message on Facebook. “The winds of fate prevailed and decided that, instead of simply raising the roof, we should just go ahead and build a new one,” he wrote. “Was not our decision but the bright side is all the money we save on imploding.” Hurwitz added that “everything will be ready for season opening,” with the first show scheduled for July. One of the first buildings to open in Columbia, the 50-year-old concert pavilion is now a key element in a multi-phase expansion of the unincorporated city led by its master developer, the Howard Hughes Corporation. Hughes transferred ownership of the pavilion in 2016 to a nonprofit group, the Downtown Columbia Arts and Culture Commission. Gehry had an office in Baltimore when he designed the pavilion, one of four structures in Columbia that he worked on for developer James Rouse. Another one of his commissions, the former Rouse Company headquarters, has been converted to a mixed-use development with a Whole Foods Market as its anchor tenant. Gehry could not be reached for comment about the roof collapse. Manhattan’s New Market building at the South Street Seaport will be demolished, despite the efforts of preservationists to save the historic building. While a 42-story tower designed by SHoP Architects was originally slated to rise on the site, and eventually killed in December 2015, the removal of the New Market building has again raised questions over what will ultimately replace it. Built in 1939 as the last part of the surrounding Fulton Fish Market, the New Market building was designed by architects Albert W. Lewis and John D. Churchill under a commission by the Works Progress Administration (WPA). However, the market has been vacant for years and deteriorated to a point where the city has decided to remove it. When exploratory work for the Howard Hughes Corporation tower took place in 2015, a spokesperson for the city’s Economic Development Corporation (EDC) stated that the entire building was in danger of collapsing due to the decaying piles underneath the market. Although preservation groups such as Save Our Seaport were successful in preventing Howard Hughes’ tower from replacing the New Market, their suggestions appear to have fallen on deaf ears this time. The market isn’t an individual landmark and sits outside of the South Street Seaport historic district, and the city has already removed some of the building’s substructure, citing safety concerns. The timeline put out by the city will see the building fully razed by the fall of this year. Community Board 1 and the EDC have been working together to coordinate the demolition, and some Save Our Seaport members see an ulterior motive behind the market’s removal. The South Street Seaport has been a hotbed of development in recent years, and advocates claim that they were told the New Market was in part being removed to put in a construction crane for the upcoming Tin Building. The Tin Building, as with the Seaport’s cancelled condo tower and forthcoming 300,000-square foot Pier 17 market hall, was also designed by SHoP and developed by Howard Hughes. It remains to be seen how the New Market’s lot will be used after work on the Tin Building is complete, or whether the two companies will have any involvement in the long-term plans for the site. 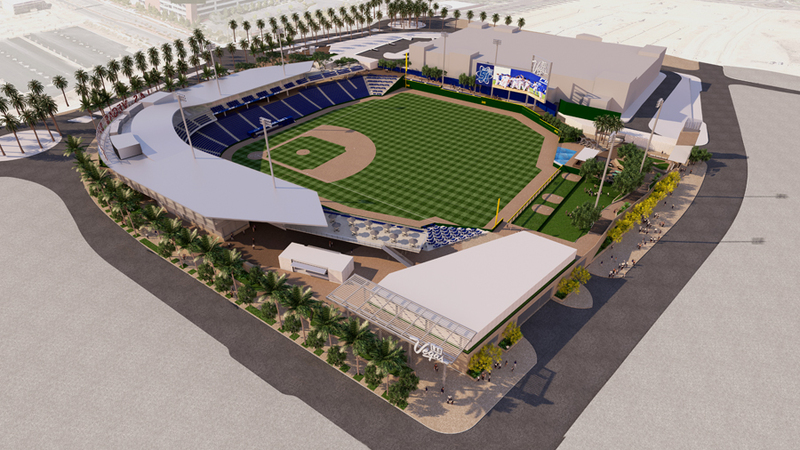 Three years ago, the Howard Hughes Corporation (HHC) bought Las Vegas’s Triple A baseball team, the 51s, with the plan of relocating the team from its outdated facility north of downtown Las Vegas to a new state-of-the-art facility in Summerlin, the company’s massive master-planned community of more than 100,000 people at the western edge of the Las Vegas Valley. Last week HHC unveiled the preliminary design of Las Vegas Ballpark, its new 10,000-capacity ballpark, designed by the San Francisco office of HOK. It is the latest sign that sports are becoming increasingly important both to Las Vegas’ ambition of becoming a “real city” as well as a driver of a new generation of more urban development. This season also marks the debut of Las Vegas’ NHL franchise, the Golden Knights, playing out of a new arena on the Las Vegas Strip (itself part of a large pedestrian-oriented plaza space on the Strip). The NFL’s Oakland Raiders, meanwhile, will relocate to Sin City in a brand new stadium starting in 2020. The new baseball park will form the centerpiece of a 400-acre tract called “Downtown Summerlin.” The ballpark will join an existing 1,000-room hotel casino, a large outdoor shopping center that opened in 2014, and a practice rink for the Golden Knights which opened last month. Over the next 10 to 15 years, Hughes expects to fill in the rest of the site with new office buildings, small parks and up to 4,000 urban dwelling units — none of which will be single-family detached homes. The design, which is still being finalized, will leverage the park's connection to the desert – the ballpark is a short drive from the color-drenched mountains of the Red Rock National Conservation Area.“There’s something about a project in the desert that’s a little bit different than a project in other places,” said Anton Foss, Managing Principal of HOK's San Francisco office. The base will be comprised of stucco and earthy burnished blocks. "We’re emphasizing the materiality of the ground — pieces of the project being of the earth," said Foss. The other design cue was the legacy of Howard Hughes himself. The aviator and industrialist originally bought up the 25,000-acre parcel that became Summerlin in the 1950s. Development of the land as a master-planned community didn’t begin until the late '80s. Foss said early plans actually considered trying to incorporate a Hughes museum on site, complete with his legendary Spruce Goose flying boat aircraft. The idea was abandoned, but it got Foss and his colleagues thinking about Hughes’ aviation legacy. Inspired by aircraft, the upper section is composed of exposed structural steel, glass and metal panels. The roof, Foss promised, “will touch the sky lightly like an aircraft wing.” A few Vegas touches are planned for the ballpark, including an outfield pool and an outfield concourse lined with games like ping pong tables and corn hole. Las Vegas usually hosts a few Cactus League games during Spring Training, so the new stadium will feature amenities like a clubhouse and a weight room that are designed to impress major league players. But the watchword here is more about grace than glitz. The design will eliminate complex vertical circulation like ramps — despite an 18-foot west to-east downward slope, the entire park can be accessed by one 360-degree, sloping circulation system. The ballpark, estimated to cost $150 million, is scheduled to break ground early next year and open for the 2019 season. As for the 51s' current home, Cashman Field, plans for next year include hosting a new minor league soccer franchise which will play alongside the baseball team until the 51s move. Beyond that, there are more question marks. The city is kicking around a variety of ideas, ranging from a sports complex (if the minor league soccer team draws interest, it could lead to a Major League Soccer franchise in a few years) to a new campus for tech giant Amazon, which has invited cities to bid for the chance to host their new headquarters. The Cashman ballpark dates back to 1983 and is one of the oldest Triple A fields in the country. It is part of a larger complex called Cashman Center, which includes a 100,000-square-foot exhibit hall. Just north of downtown Las Vegas, but cut off by an elevated freeway, the Cashman site is adjacent to a popular outdoor neon museum and a public library. The ongoing redevelopment of downtown Las Vegas has yet to cross over the freeway. For Tom Warden, Senior Vice President with the Howard Hughes Corporation, the future of both Downtown Summerlin and Downtown Las Vegas are bright. For him, the 400-acre Downtown Summerlin site is a dream opportunity to implement New Urbanist policies devoted to walkable, pedestrian-scaled environments on an unprecedented scale. “To be able to build that way tabula rasa is an exciting thing for planners,” he said. 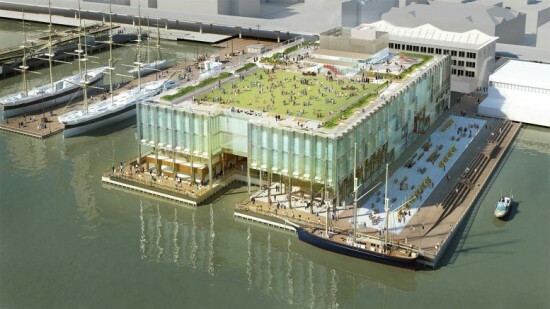 On October 20, the Landmarks Preservation Commission (LPC) approved the Howard Hughes Corporation and SHoP Architects' re-visioning of the South Street Seaport's Pier 17—with one crucial change. The developers will comply with the LPC's request to remove a glass pergola shading the rooftop lawn. 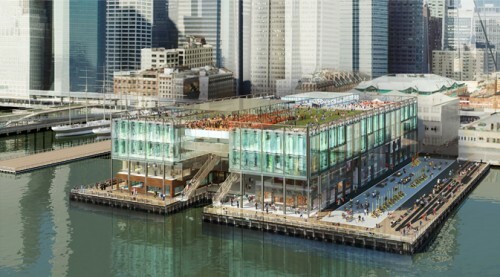 The 250,000-square-foot, $200 million Pier 17 retail mall and public space is the anchor of the Seaport makeover. Though the LPC approved the design in 2013 (and construction has begun), the LPC review last week was precipitated by the addition of the pergola and the demolition of the adjacent Link Building, two unapproved aspects of the initial development plan. When the pier plan was introduced in August, the LPC raised concerns about the pergola. Neighbors' fears were classic NIMBY: residents worried that covering the lawn would draw bigger crowds to the Seaport's popular concerts and events. Though the LPC can't regulate city vistas, neighbors also voiced concerns that the pergola would block views of the Brooklyn Bridge. Now, residents will enjoy unobstructed—or at least less obstructed—views of the bridge, as well the last coup from the LPC meeting: modified paving on the site's access road. The road is an extension of Fulton Street that will encircle the front of the pier. Instead of asphalt, visitors will tread on precast concrete pavers. Though the Pier 17 deal seems like a relatively utopian public-private compromise, controversy over the overall development looms. Neighbors and preservationists have greeted SHoP's planned, 42 story, 500 tower with vociferous opposition. While the tower is not in a historic district, and thus outside the LPC's purview, the community continues to debate the project. Another major (and potentially contentious) project in the area is the S. Russell Groves–designed, 60 story skyscraper at 151 Maiden Lane, announced in September. The typology of the South Street Seaport reflects its status as one of New York's oldest districts. Like all historic neighborhoods, it must contend with the priorities of a densifying city. It remains to be seen how SHoP's plan, and other nearby redevelopments, impact the district's function and character. After seven years in business, the New Amsterdam Market near New York City’s South Street Seaport is closing up shop. “We held a total 88 markets and numerous innovative celebrations of our region's bounty; supported nearly 500 food entrepreneurs; and contributed to the creation of more than 350 jobs,” Robert LaValva, the market's founder, said in a statement. “However, I was never able to raise the funding or attract the influential backers needed for our organization to thrive.” The news of the market’s closing comes in the midst of an ongoing debate over the Seaport's future, which could include a 50-story residential tower. 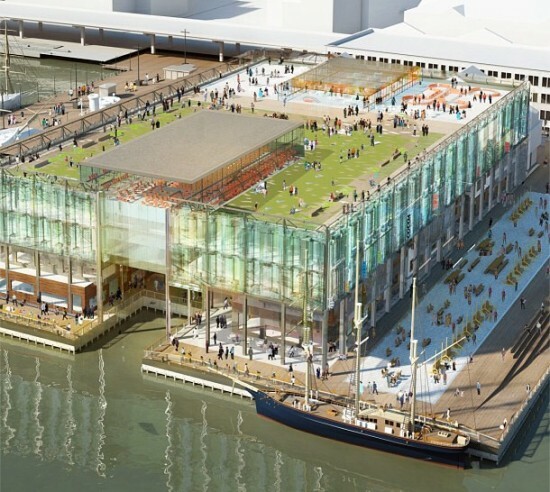 The fate of that project is not certain, but the developer behind it, the Howard Hughes Corporation, is already demolishing an old shopping mall on the Seaport’s Pier 17 to make way for a glassy, 300,000-square-foot replacement designed by ShoP Architects. According to LaValva, this type of development is to blame for the popular market's demise. He went so far as to call Councilmember Margaret Chin’s support for Howard Hughes' plans a “mortal blow” to the New Amsterdam Market. In a statement issued shortly after LaValva's, the councilmember said she was saddened by the market's closing, but that she was not to blame for it. “I proudly helped secure funding from the City Council and the Lower Manhattan Development Corporation in order to support the New Amsterdam Market. I made sure to provide Mr. LaValva and the New Amsterdam Market with opportunities to formalize his relationship with the City,” she said. “Now, Mr. LaValva is trying to publicly blame me for a situation he could have prevented by working more collaboratively with my office and the City. It might make for an attention-grabbing email blast, but it’s not the truth.” The New Amsterdam’s last market was held on June 21st. Last Wednesday, the New York City Council unanimously approved plans to tear down the current Pier 17 in the South Street Seaport and build a new $200 million SHoP Architects-designed mall in its place, marking the end of the long and sometimes contentious ULURP approval process. Crain's reported that Dallas-based developer Howard Hughes made some concessions to the council including pushing back construction on the project to allow Hurricane Sandy-battered tenants to have an additional summer season, with construction now anticipated to begin on October 1st. SHoP's design calls for a mix of boutique and large retail spaces inside the 250,000-square-foot facility connected by open air pedestrian corridors. Large glass garage doors can be lowered during inclement weather to protect these open spaces. The new building will be capped with an occupiable green roof. As part of the City Council approval, the developers will also build two new food markets adjacent to the new structure in the old Link and Tin Buildings. The project is expected to be complete by 2015. Besides Pier 17, SHoP is also designing another waterfront mall in Staten Island called the Harbor Commons. It seems that a proposal to make the New Amsterdam Market a permanent fixture in the South Street Seaport's former Fulton Fish Market building has every food critic and preservationist in New York City revved up, and touting the plan as the next big game-changing development for Lower Manhattan. 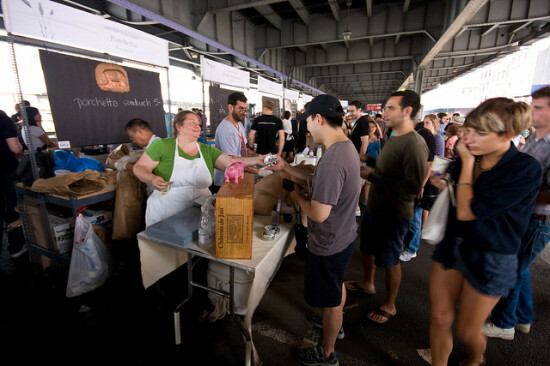 New York Times opinion and food columnist Mark Bittman went so far as to say that this expansive food market has “wonderful potential that dwarfs even that of the High Line.” Robert LaValva, a former city planner, first launched the market in 2005 after the fish market relocated to the Bronx. He looked around and realized that, unlike a number of cities, New York City didn’t have a large-scale food hall or market. And so he modeled his vision to create a permanent food market in the Tin and New Market buildings after places such as Pikes Market in Seattle, the Ferry Building in San Francisco, or Les Halles in Paris. Today the City Council is holding a public hearing to determine the future of the South Street Seaport. The Howard Hughes Corporation (HHC), the developer that rents Pier 17 next to the Fulton Fish Market, has enlisted SHoP Architects to redesign the struggling 250,000-square-foot mall. The plan calls for new boutiques, restaurants, rooftop shops, a concert venue and museum. 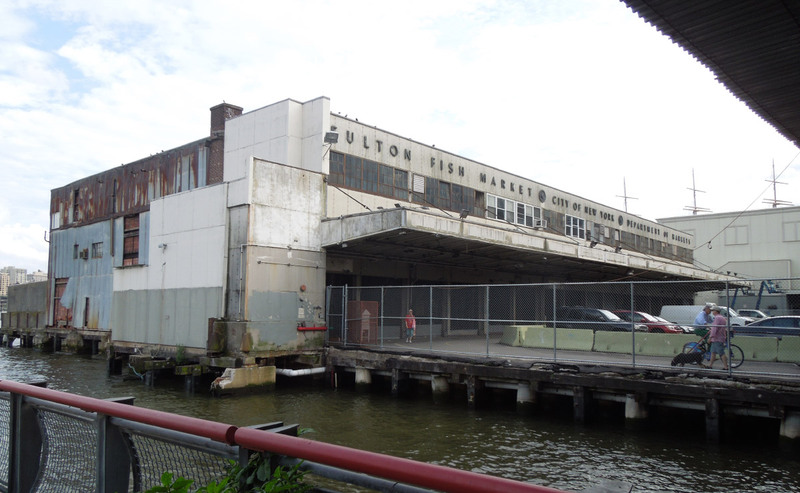 But the question remains whether these changes will extend to the Tin and New Market buildings that once housed the old Fulton Fish Market, and is now the temporary weekend home of New Amsterdam Market. Supporters of the food market are concerned that the overhaul of Pier 17 could pave the way for development on the former site of the fish market and have launched an online petition to bolster their cause. HHC, however, hasn’t indicated any plans to raze or rebuild at the site. Last night, SHoP's Gregg Pasquarelli presented plans to Community Board 1 for South Street Seaport's Pier 17. Not surprisingly, the reception was positive. The design is a huge departure from the desolate barn-like mall developed by the Rouse Corporation in the 1980s, where to this day nachos and tropical cocktails remain de rigueur. 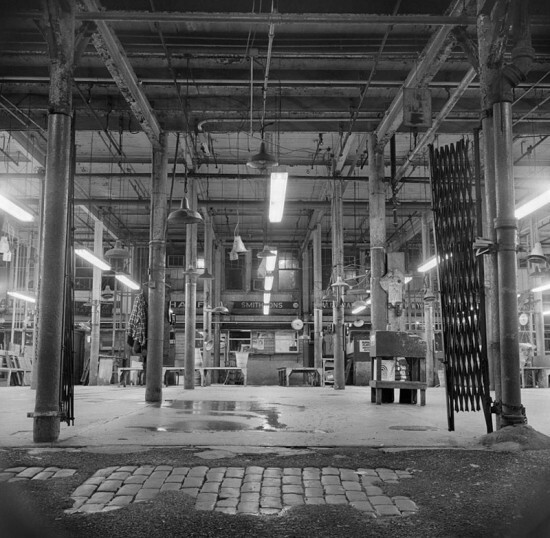 The new owner, the Howard Hughes Corporation, hopes to bring New Yorkers back to one of the most spectacular sites in town, while welcoming tourists and not quarantining them in a thematic trap. Angelica Trevino and Thorsten Kiefer are SHoP’s project managers. In a telephone interview, Trevino parsed the details... The new pier will contain four stories of retail with a green roof that would hold two pavilions, one for music and the other for a restaurant, and the entire structure features an exposed steel frame. 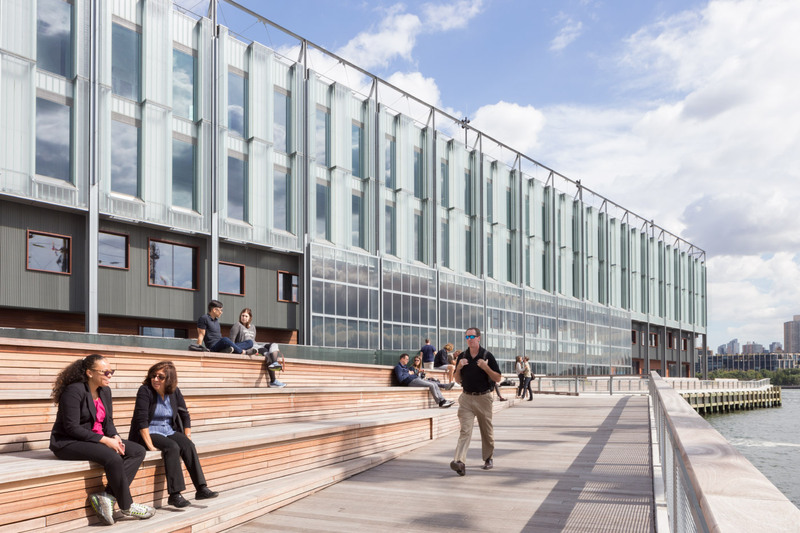 The landscape, designed by James Corner Field Operations, includes the rooftop, a large deck to the north overlooking the Brooklyn and Manhattan bridges, and a plaza to the south. The first two stories of the pier include the ground floor and a mezzanine with two story high glass doors that will slide open vertically. When open, the doors front the glass enclosed second and third stories. Shops on the first two stories set back several feet from the openings. The architects refer to the area as “The Village.” The storefronts in lower the section are a series of shifting volumes clad in wood, textured aluminum and zinc. A large east/west opening runs through the pier forming an extension to the mainland grid, while two diagonal cuts also run through the space so as to open view corridors of the Brooklyn Bridge to the piers. 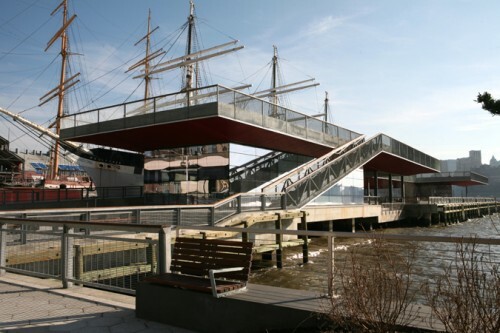 On the East River side of the building, two metal mesh gangplank stairs ascend up from the east/west opening to the glass enclosed third floor. The glass wrapping the third and fourth floors plays with the notion of the pixilation. As support columns are 20 feet apart, five vertical sections, four feet wide, set back a foot and half, then return, set back, and return—lapping to and fro, like East River ripples. A combination of channel glass and vision glass heighten the effect. “We didn’t want it to be a taut glass box,” said Trevino. “We wanted it to have some articulation, to break up the mass and resemble some of the waterfront tectonics.” Inspired by open-air concert hall at Tanglewoood, a rooftop glass enclosure (60’ x120’) will hold and audience of 500 to 600. In warm months, the pavilion doors will open and music will spill onto a rooftop lawn. A smaller pavilion to the east will house a restaurant. To the north of the pier, a plaza by Field Operations called the “North Porch” will provide one of the most iconic views in the city, with Brooklyn Bridge and Manhattan Bridge in the very near foreground. More pixilated patterns fall underfoot in wood, saw cut cobblestone, and solar pavers that absorb light in the day and give off light at night. On the south side Fulton Plaza will be transformed with wood reclaimed from the old pier. Before all eyes and ears were focused on the mayor's announcement about Cornell and their EDC project upriver, AN was downtown for a much quieter opening of yet another EDC project. Without fanfare, the SHoP-designed Pier 15 opened to the public today. With the exception of another photographer and a family visiting from Spain, we were the only ones at the pier when the security guard unhooked the chain. Across from Maiden Lane, the new pier is an exercise in restraint with two reflective glass pavilions supporting the top half of a bi-level pier. Once common in the Victorian era, bi-level piers are rare today. The upper-level of this pier sports three small rolling lawns, slightly arched in profile, that overlook the East River. The pier adds 50,000 square feet of public space to the East River Waterfront Esplanade. The project, a joint effort with City Planning, stretches from the Battery Park Maritime Building (the Governors Island ferry) to Pier 35, just north of the Brooklyn Bridge. Of the two lower level pavilions, one will become a restaurant, to be run by the same company that operates as a smaller restaurant nearby in a pavilion on the East River Esplanade. The second lower level pavilion will accommodate a maritime museum. The RFP for the restaurant and marina have yet to be announced. With the work complete, South Street Seaport's Pier 17 appears all the more needy. As AN's Eavesdrop column reported back in July, the city is still in the midst of negotiations with the Howard Hughes Corporation to revamp the dated pier/mall. SHoP's Gregg Pasquarelli recently told New York magazine that the firm relishes tackling the next stop north.